Are you in search of the best hostels in Switzerland? You’ve certainly landed on the right page. 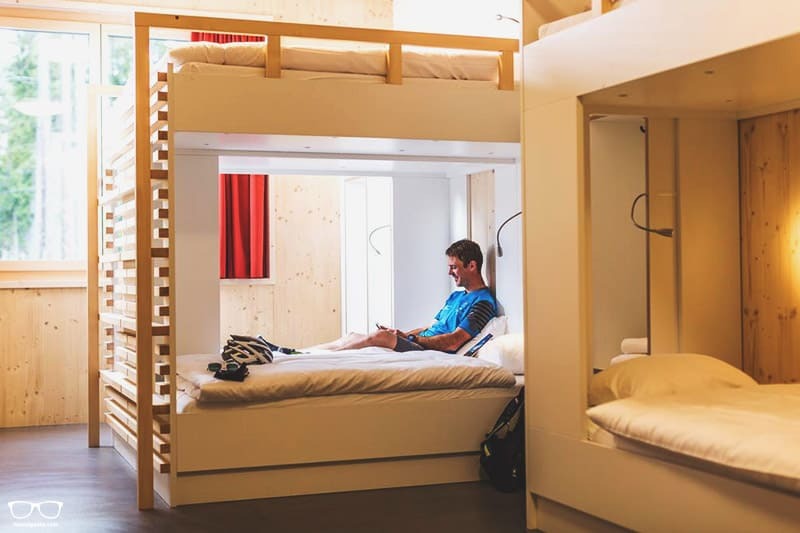 Here we’ve collected the coolest hostels for backpacking Switzerland just for you. Switzerland is the perfect destination for hiking, skiing and tasting of great food. Wait until you see some of the hostels nestled in the mountains – the location and architectural design is fantastic! We’ve included all of the main destinations such as Zermatt, Zurich and Lausanne. Unfortunately, there are no super impressive hostels (a few exceptions are around!) here and as you’ll see; every destination we’ve included has only one hostel listed. However, the chosen top hostels in Switzerland are a good option for solo travellers, couples on a budget and backpackers Switzerland. Another option during your Swiss adventure is to check Airbnb. Enjoy our 35€ Airbnb discount here. 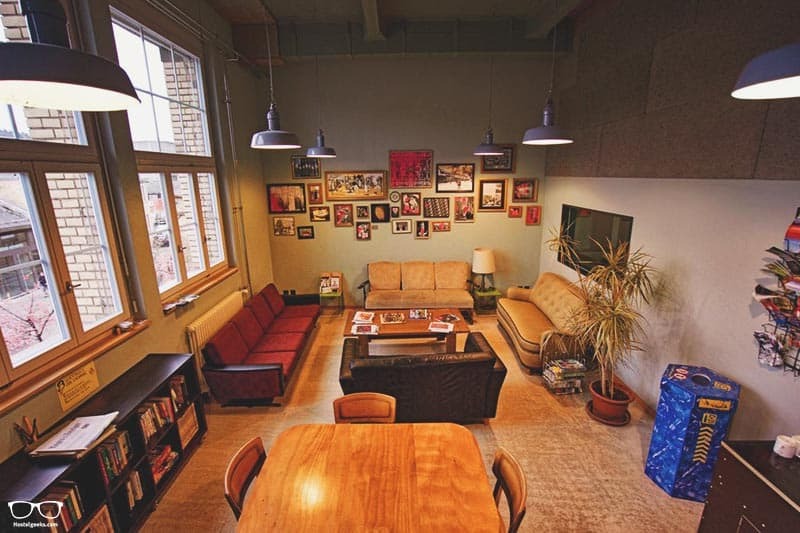 We are Hostelgeeks and we discover the world’s greatest hostels, including the coolest hostels in Switzerland. If you want to skip directly to a specific location, here you have the city/town list. If you want to know all the best hostels around Switzerland, just keep scrolling. 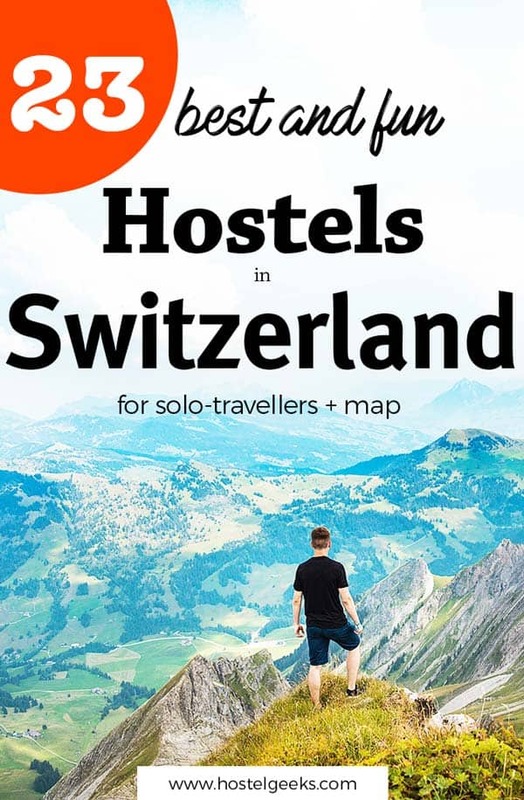 Super helpful for your planning: check out the handy map at the end of this article pinpointing all of the best Switzerland hostels. We feel a map is always so useful. Most likely your Swiss adventure will kick start in the capital of Bern. This beautiful city is a UNESCO world heritage site and is perfect for any traveller interested in historic features and old town city vibes. Unlike many other capital cities across the world, Bern has only a handful of hostels. Quite unusual for Europe. If you’d like to stay in a listed building that’s recently had an ultra-modern re-design; look no further! There’s nothing at Bern Youth Hostel but bright, big and clean spaces. We just love the private rooms with river views out of the door-sized windows. Who wouldn’t?! You needn’t travel far for a decent meal – just head down to the restaurant bar and lounge. Let us head up into the beautiful mountains to the small village of Gimmelwald. Don’t mistake this for the famous resort Grindelwald in the next valley. Oh no, this is far less touristy and one of the offbeat areas backpackers will love! Get ready for cowbells, wooden huts and stunning mountainous valleys. 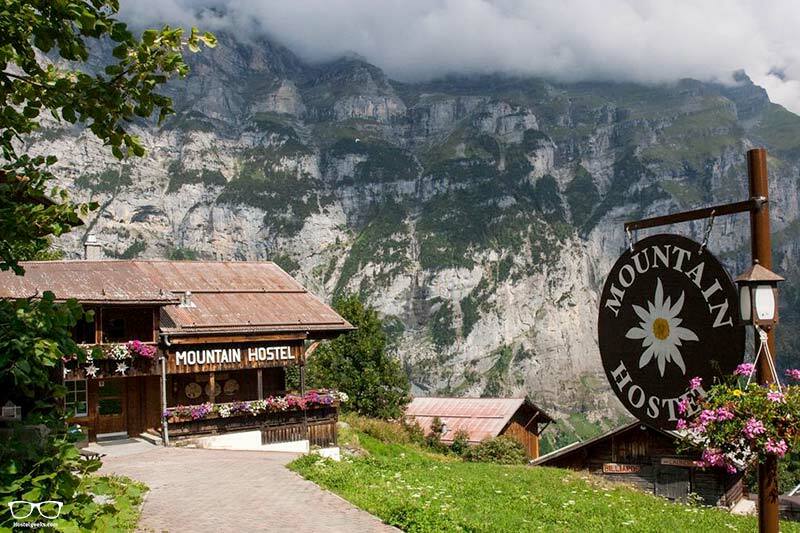 And guess what; there is only one hostel in Gimmelwald, and it happens to be awesome. This is most likely going to be a love at first sight moment for you. Not only is this hut-style hostel gorgeous, but you’ll also be surrounded by hiking trails, via ferrata and rafting opportunities. Certainly a top choice for outdoor enthusiasts! In the evenings enjoy a game of pool or cards and enjoy a cold beer on the decking. Wonderbar! Interlaken won’t disappoint with its insane natural beauty and outdoor opportunities. It is known as the Sports capital in Europe. I have to tell you: Interlaken is the place with most amount of incredible high adrenaline activities. The adrenaline Sports + the mind-blowing scenery. STUNNING!! Interlaken has also traditional resorts offering great skiing and hiking trails in the surrounding mountains. You know that typical postcard picture of mountains, lakes and old timber postcards? We’re pretty sure it was taken in Interlaken. Does breath-taking natural beauty tickle your fancy? Backpackers Villa is surely the place for you! 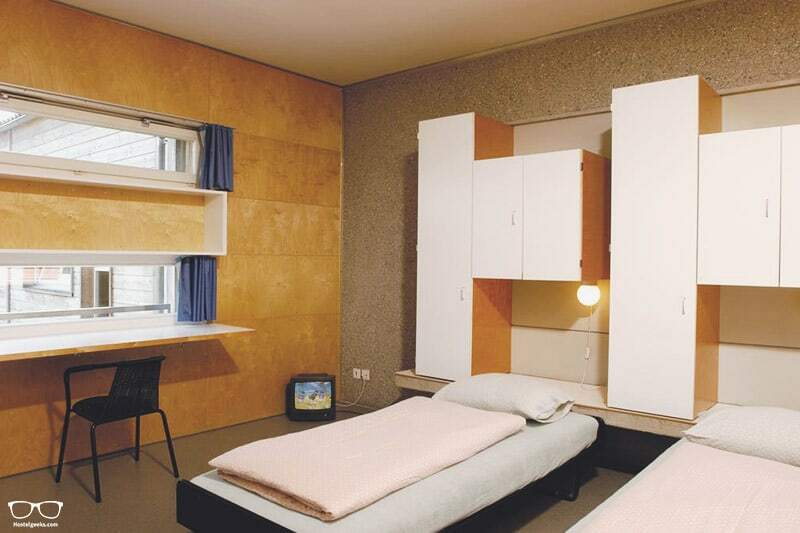 Choose between dorms and double rooms both with shared and en-suite facilities. There’s a large garden to chill out in around the back and a large park at the front – plenty of space to mingle. The price of your stay will also give you access to local swimming pools, mini golf and a delicious continental breakfast to kick-start your day. 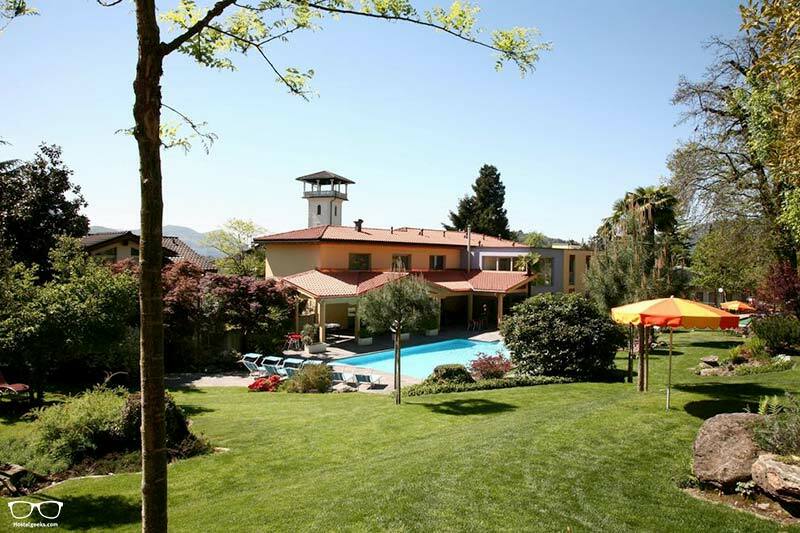 Backpackers Villa is the best hostel in Interlaken Switzerland.It is a family-friendly hostel with fun activities and every sports activity can be booked with them. Good to know: Every single team member of the hostel did ALL sport activities. Ask for their recommendation, they can help you first-hand experience! How to apply the voucher? Additionally, you get the benefits mentioned above. Pretty sweet deal! Again, the promo code is applied automatically, and you should see rates with 5% off. Any problems with the voucher? Please get in touch! 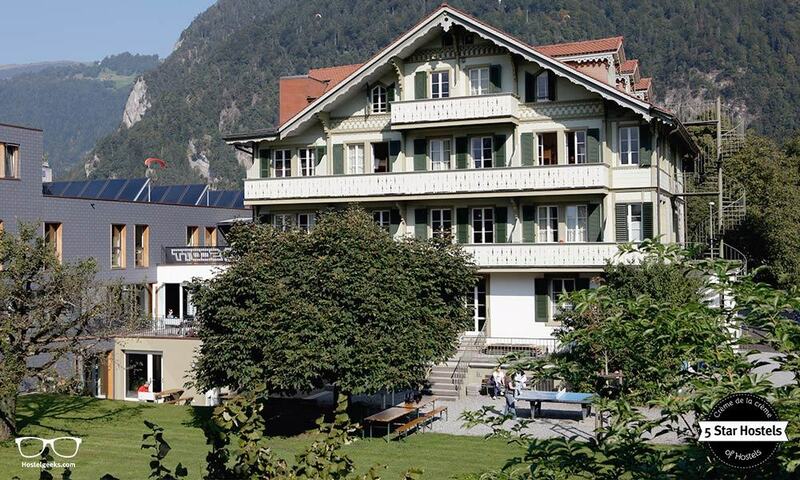 Our second recommendation for the best hostels in Interlaken Switzerland is Balmers Hostel. 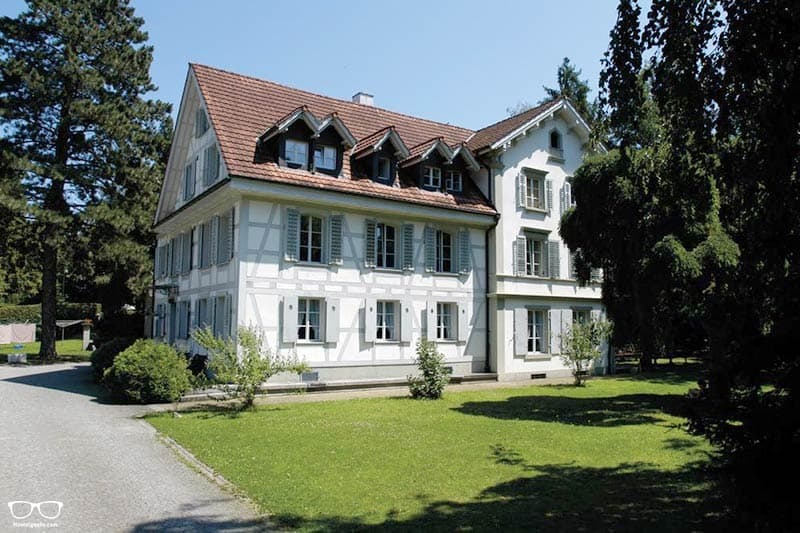 It is quite different from Backpackers Villa Sonnenhof. It caters to the younger travelers and the party traveler. 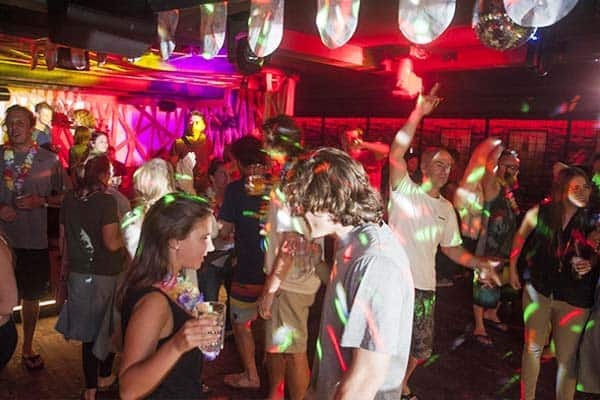 Balmers Hostel is one of the most famous party hostels in Switzerland. The in-house bar is inviting, and it is a real fun place to have a cold drink after a long day of extreme sports. The location? It is just a 5 minute walk from the Backpackers Villa, so as well super central. Interlaken itself is small anyways. You can walk basically everywhere. Good to know: the bar is open for everyone. So even if you are staying at another hotel or hostel in Interlaken, come over for a fun night out. If you’re unfamiliar with Crans-Montana never fear. It was only in 2017 that the municipalities of Mollens, Montana, Randogne and Chermignon merged to form what is now known as Crans-Montana. 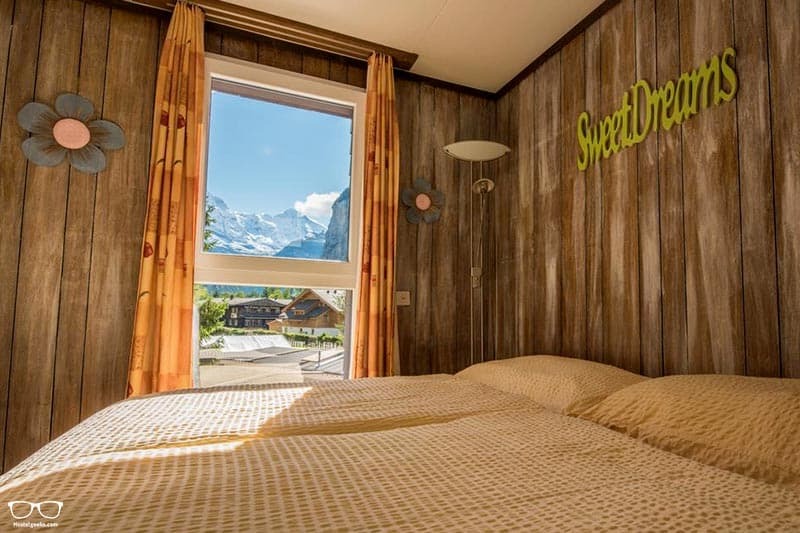 Sleep at altitudes of 1500 m and enjoy views across stunning peaks including Matterhorn and Mont Blanc. Why not! This 1930’s historic monument has been transformed into a hotel-like hostel perched on top of a mountain. Solo travellers that appreciate privacy are in luck: Crans Montana offers both female-only and male-only dorms available here. Enjoy spacious terraces, panoramic views and a spacious lounge filled with 1920’s furniture. Welcome to the home of the winter Olympics, twice fold! There is a frozen lake here that hosts polo, cricket and even horse racing on ice. Yes, you did read that correctly. Fun fact about St. Moritz: James Bond dashed down the ski slopes here in ‘The Spy Who Loved Me’. 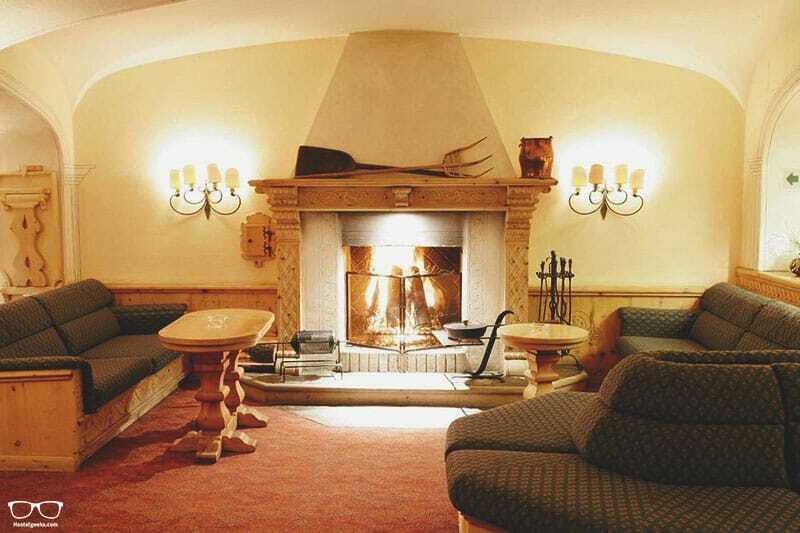 Let us have a look at the handpicked Hostels in St moritz. 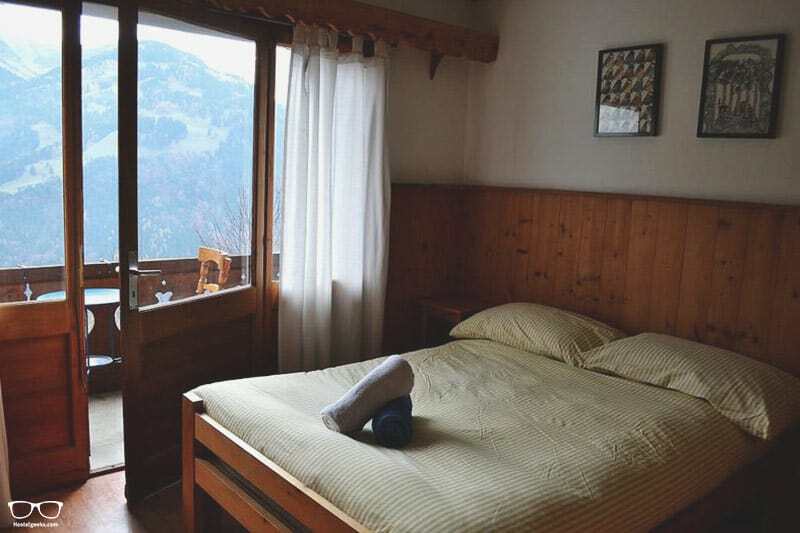 Number one on the list is our Hostel St Moritz Petit Steffani. This is a wonderful option for couples looking for an affordable yet comfortable stay, just metres from the mountain lifts! Note: there are no dorm rooms here, only single and double rooms. You will LOVE this place. 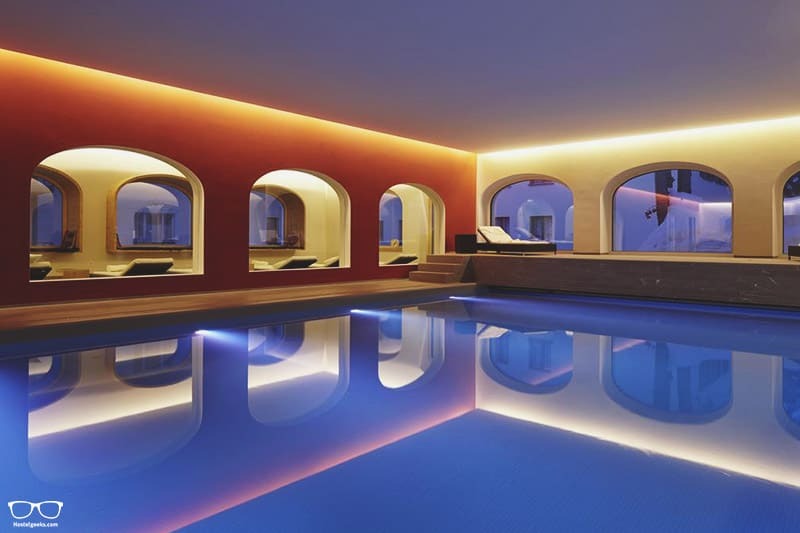 Have you seen the indoor swimming pool? 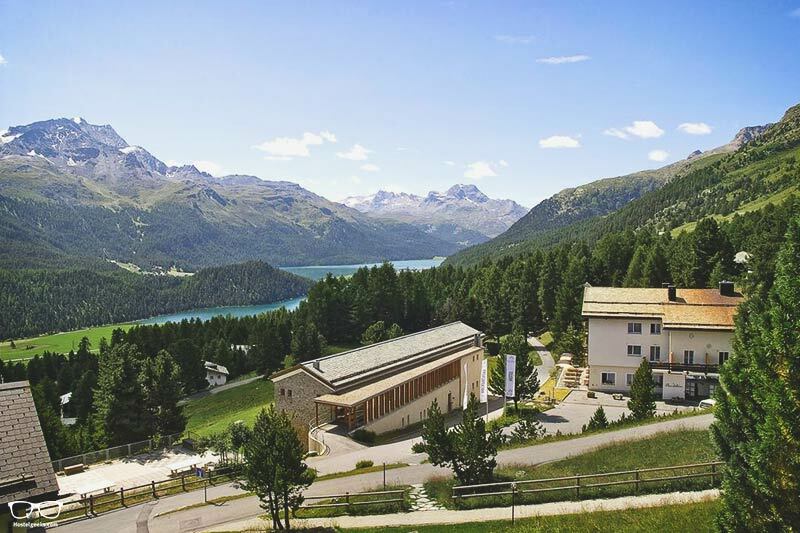 Randolins is perched on the Suvretta hillside; the prettiest place in St. Moritz. Alongside the on-site restaurant, there is a recreation room and a room to store skis and bikes. This makes it all the more easier for outdoor enthusiasts! Choose between dorm and private options all of which have running water and Wi-Fi. This pretty city lies alongside the Rhine River close to the borders of France and Germany. It’s the place to visit for those keen to get up close and personal with some seriously cool Gothic architecture! 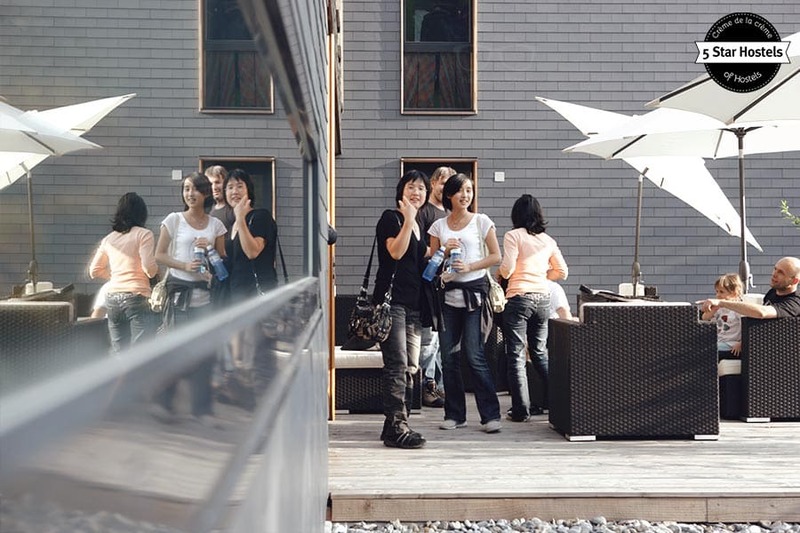 This designer hostel has successfully married old charm with contemporary architecture. 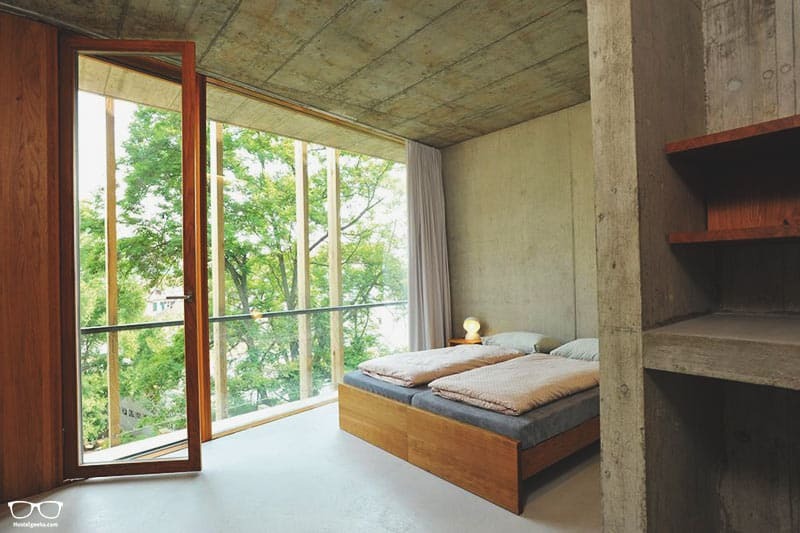 It’s a design hostel lover’s dream! 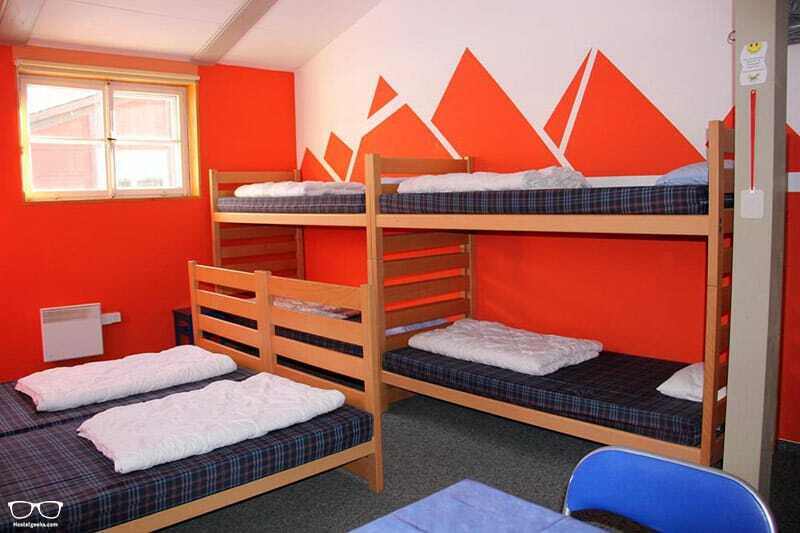 Mixed dorms and private rooms are available, all of which are spacious and welcoming. Bed linen is also included here. Enjoy a central location and escape the metropolis by spending some downtime on the wooden terrace. Fancy getting away from it all? Lenz has a population of fewer than 600 people, so we think it’s the perfect destination for some peace and quiet. Unsurprisingly, Lenz is another mountainous area and a great place for skiing. Another Backpackers Haven in Switzerland. When the nearest airport is 112 km away, you know you’re headed to a beautiful, secluded place. Nordic Hostel is big, modern and perfectly designed for people returning from a big day in the hills. There is a restaurant on-site, but no shared kitchen. Before you panic; breakfast AND dinner are included in the price! Rent some ski equipment a bike by day, and relax on the terrace or in sauna by night. Welcome to the second most populous city in Switzerland! Picture this: standing by the side of Lake Geneva, surrounded by the Alps and the Jura mountains with views of dramatic Mont Blanc. 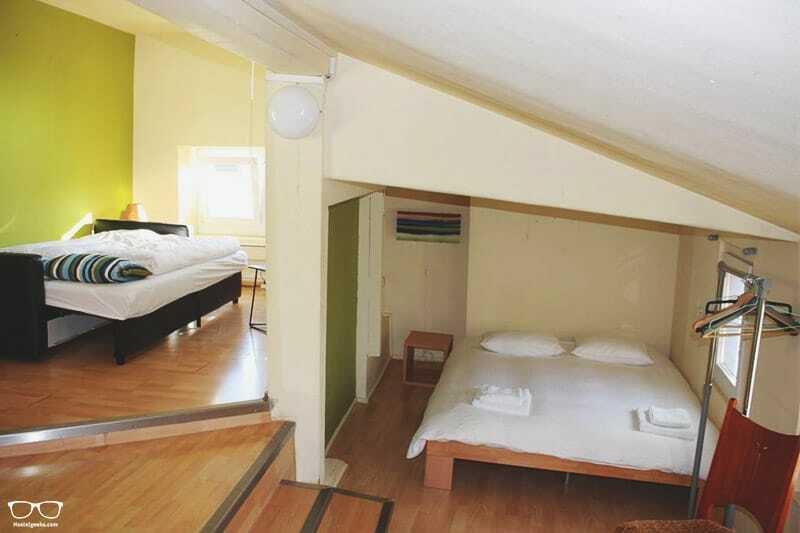 Slap bang in the middle of the tourist area; City Hostel is just 950m from Lake Geneva. Choose between single, double and dorm rooms. All of them come with WiFi, heating and computer workspace – great for digital nomads on the move! 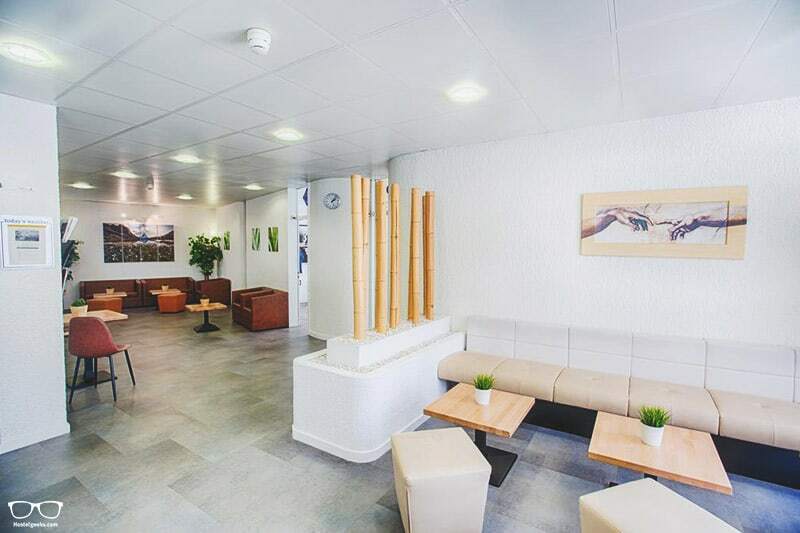 There’s also a lovely common area to chill out in, and a common kitchen for all to use. How lovely is the name Winterthur? It sums up what to expect before you even get there. So yes, expect chilly temperatures in the winter. However, at an elevation of only 440m, the summer is quite pleasant in this part of Switzerland. This is the place for modern art museums including Picasso and Klee. Make sure to visit the hilltop Rosengarten for lovely views over the old town. You won’t be disappointed with this choice – it’s truly stunning! The rooms are individually decorated and made to feel super homely. Depot 195 is a great option for families, couples and solo travellers alike. The Lauterbrunnen valley is well known for its 72 waterfalls and majestic cliffs. It is this natural beauty that did indeed inspire J.R. Tolkien’s Rivendale from Lord of the Rings! Outdoor enthusiasts: we deem this a wonderful starting point for you! If you are able to pronounce this hostel name, someone will invite you for a beer for sure! Schutzenbach is a clean, safe and fun backpackers for travellers aged 18-35 years. 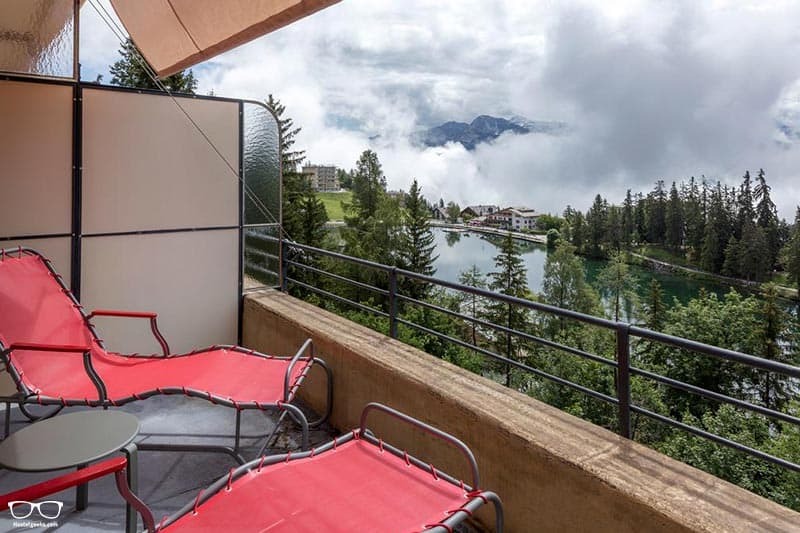 All private, shared and twin rooms come with possibly the best views Switzerland has to offer! This hostel is open throughout the year so can be enjoyed for either hiking or skiing. The on-site bar is there to serve you up a refreshing drink whatever the weather. Good to know: bathrooms are situated far from the rooms. Not a deal-breaker, but worth it to know. 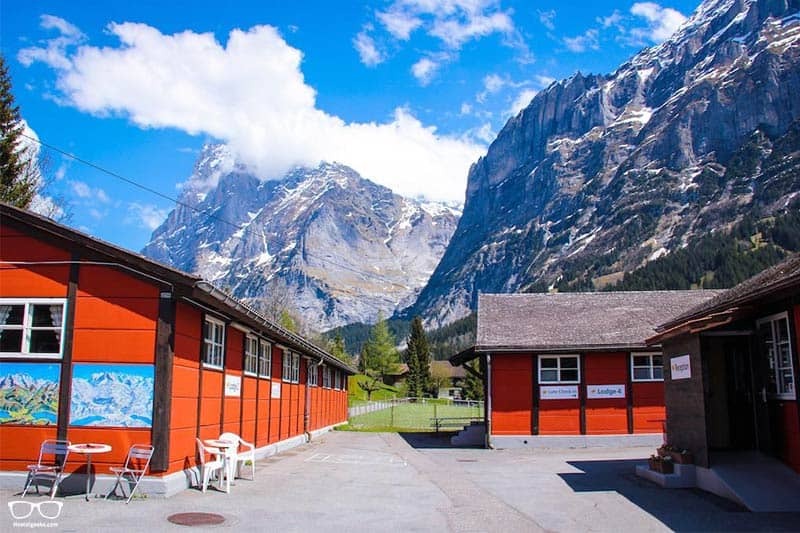 The Valley Hostel is one of the coolest Lauterbrunnen hostels. 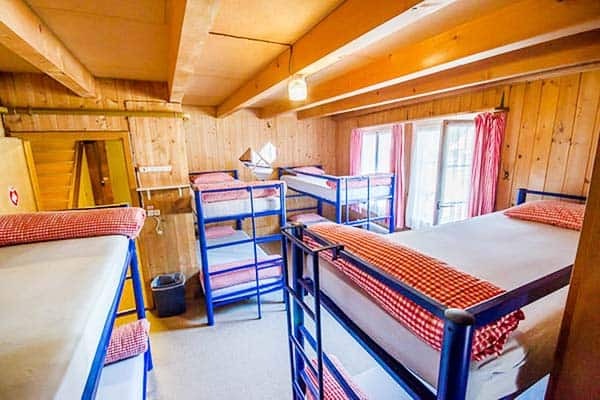 This colourful hostel offers a range of rooms from 5-bed and female-only dorms, to private and family rooms. No matter what time of year you visit; the staff have plenty of fun ideas for the surrounding mountains. Just ask them about tour opportunities in the area. Chill out on the long decking area after a long day. In the summer this is the perfect place for a BBQ! It’s time to come down from the mountains and explore the largest city in Switzerland. It can always be a bit of a shock to the system returning to a crowded city, so consider a visit to Zurich either at the beginning or end of your Swiss adventure. Even though it’s considered one of the most expensive cities in the world, you won’t break the bank when it comes to hostels. 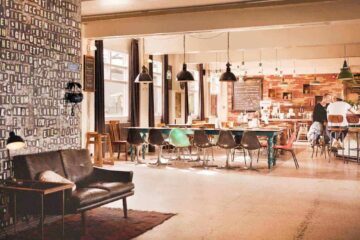 Find the full guide to best hostels in Zurich here. 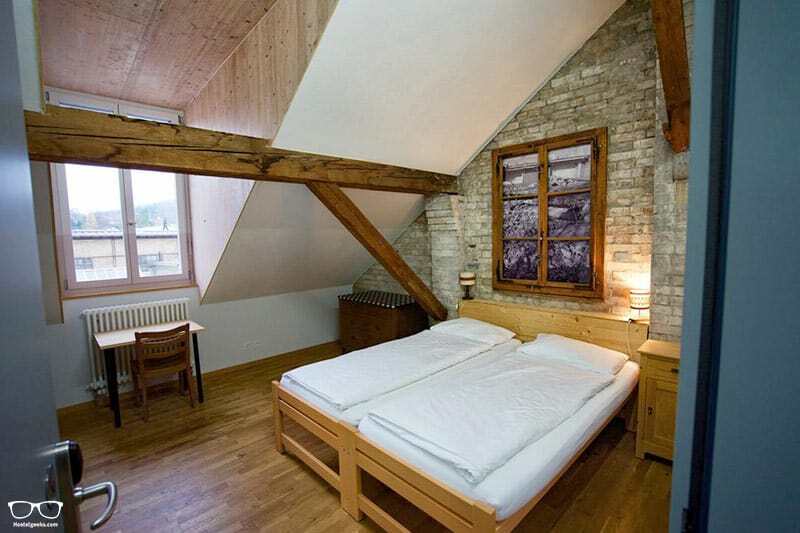 Our #1 recommendation in the nearby city of Winterthur is the new Hostel Depot 195 Winterthur. Set close to the Old Town in Winterthur in an industrial building, this is an old-meets-modern accommodation great for backpackers. Winterthur? A beautiful small city just 25 minutes from Zurich. It’s an fantastic hostel in an area well worth visiting. Honestly, we think it’s better than any hostel in the centre of Zurich. If you’re really keen on a second option, we’d like to introduce you to the newly renovated hotel to hostel Oldtown Hostel Otter. This one is above a trendy cafe-bar! What’s cool is that the upper floors have been kept at a hotel standard, whereas the lower floors have been converted to dormitories. 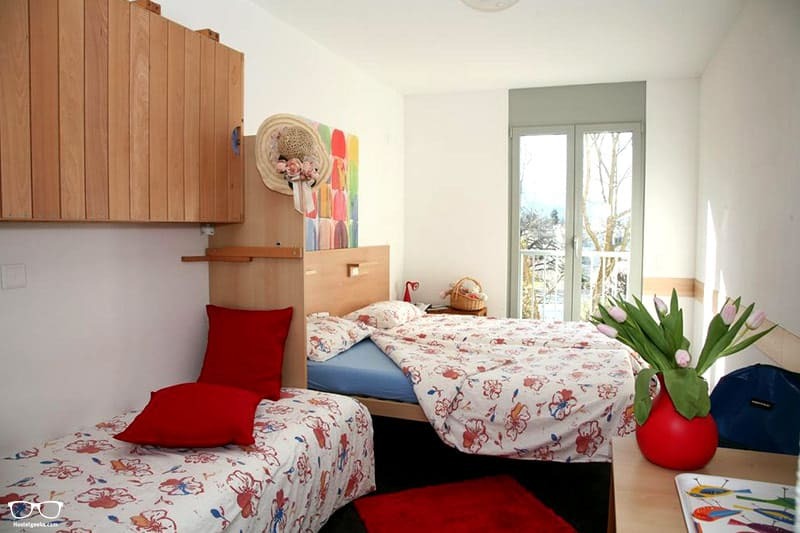 This is certainly a basic Swiss hostel, but it boasts superb cleanliness and wonderful staff. It’s just a stone’s throw from the lake shore and a 30-minute walk from the city centre. 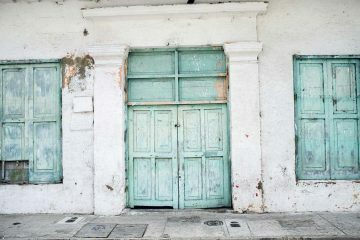 A great budget option for young travellers of all types, including female solo travellers that would like a lady-only room. There’s 24-hour reception, a cosy bar and free breakfast included. 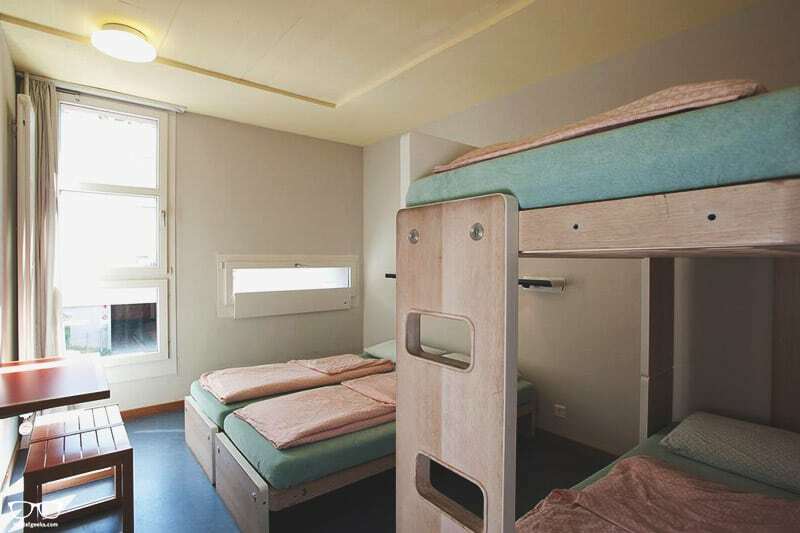 Again, Youth Hostel is the best option for cheap hostels in Zurich. This is your chance to experience altitudes of 1600m and intimate views of the infamous pyramid-shaped Matterhorn peak. The main street of Bahnhofstrasse is home to boutique shops, après-ski venues and inviting restaurants. Public outdoor ski-rinks and curling are also at your disposal! 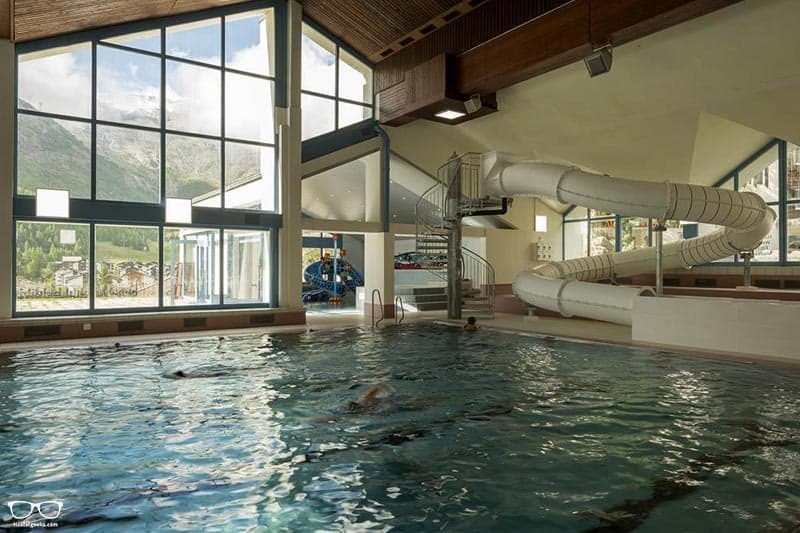 We consider the best hostel in Zermatt to be the Youth Hostel Zermatt. It is, in fact, the only hostel in Zermatt, and it happens to be pretty special. This is a very typical Swiss mountain accommodation that will have you feeling right at home in no time. Is there such a thing as a shared dorm with views of the Matterhorn? Yes – right here! Note: there is a large hill to climb in order to reach this hostel. To be expected when you’re in the mountains! Lausanne is a French-speaking city on Lake Geneva. Away from the hustle and bustle of modern city life is a hilly old city with medieval shop-lined streets and a 12th-century Gothic cathedral which is a must see! 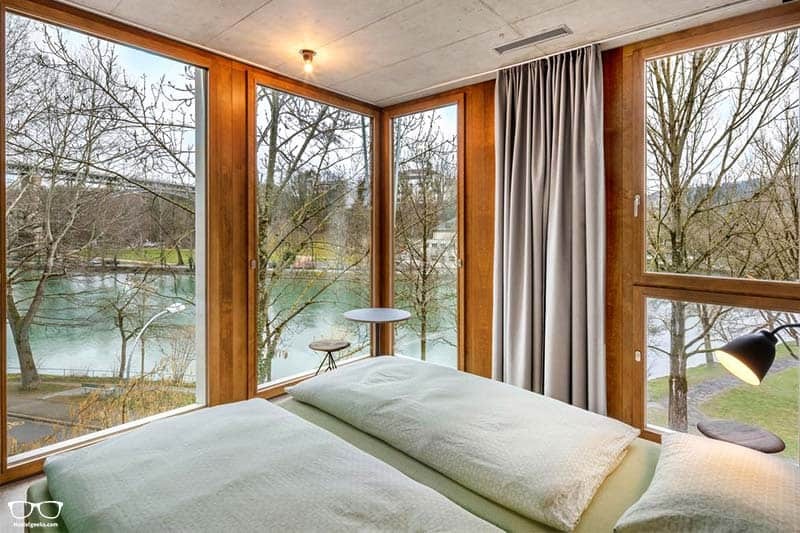 Fancy sleeping less than 100m from Lake Geneva? No problem! 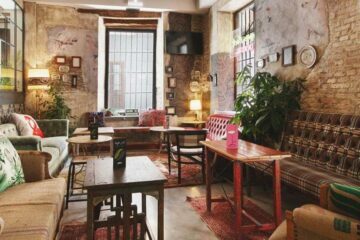 This is a superbly simplistic hostel offering a bar, restaurant and daily buffet breakfast. Bicycle rent is also available and a wonderful option for exploring Lausanne. Lucerne is a popular tourist spot purely for the natural beauty surrounding it. There’s a unique mix of glistening shores and medieval architecture set amid snow-capped mountains. It’s a compact city that speaks primarily German. Luzern Youth Hostel is built on an international atmosphere that offers a quiet retreat in the city. The rooms here are pretty big, ranging from 4-20 bed dorms. This includes male and female-only options. Relax either inside or outside at the social areas and challenge new friends to a game of pool or ping-pong. The area of Gryon was only established in 2009 and takes up a whopping 15 square kilometres of space! How quaint. This is the perfect getaway for travellers in search of peace and fantastic hiking trails all to yourself. When it’s foggy in the valley, you’ll be sipping coffee in the sunshine at Chalet Martin! 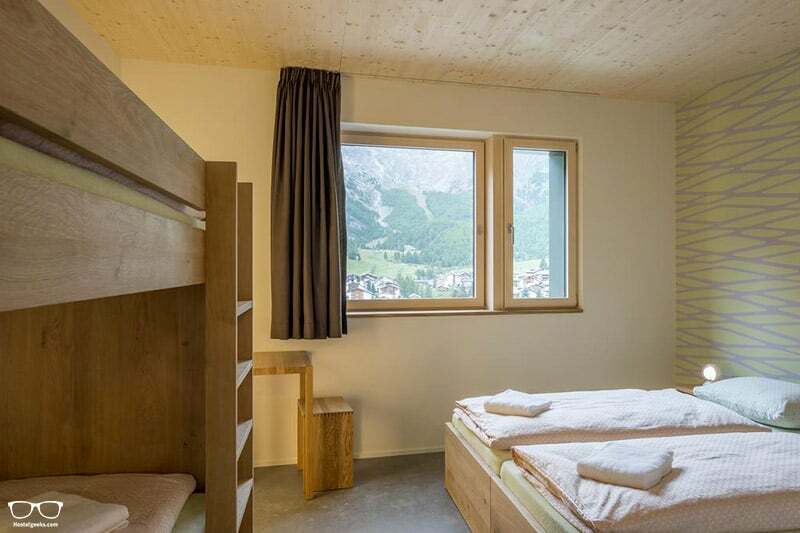 Standing 1180 metres, this gorgeous backpacker hostel offers a true Swiss experience. Linen is included in all private and shared rooms. But honestly, it’s the view of the mountains that will really steal your heart. Note: this is a shoeless hostel so pack your slippers and allow your feet some downtime. Personally, we love to leave the shoes outside; makes it more like a home. Calling all dare-devils! 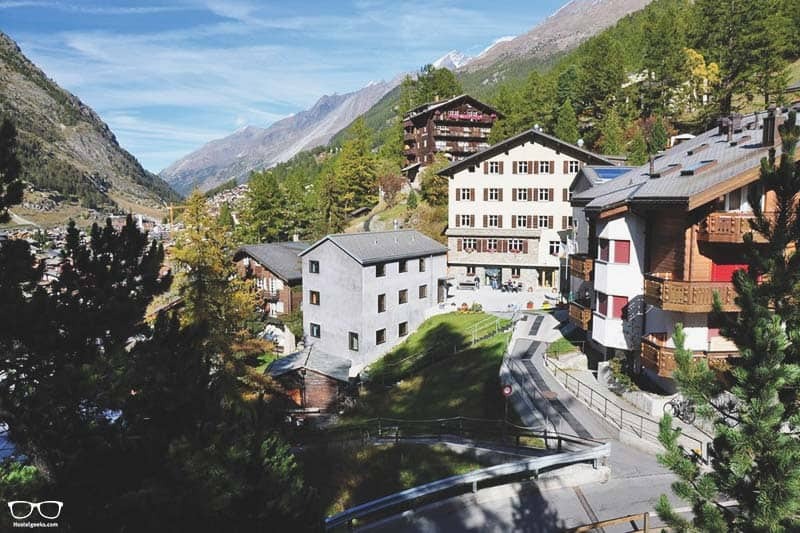 Saas-Fee is in proximity to several peaks standing over 4000m, and the gateway to over 100 ski slopes. It’s a snow-babies heaven in the winter and hiker’s paradise in the summer. 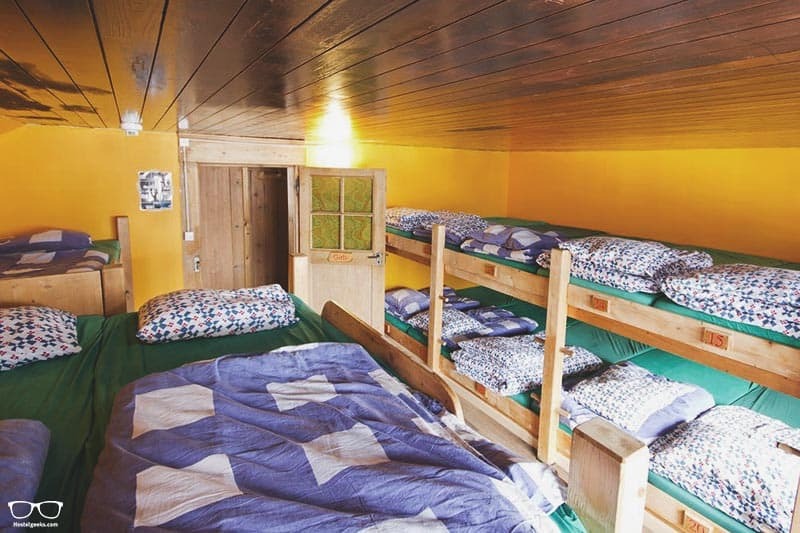 You’ll certainly want to check out the coolest hostel in Saas-Fee. 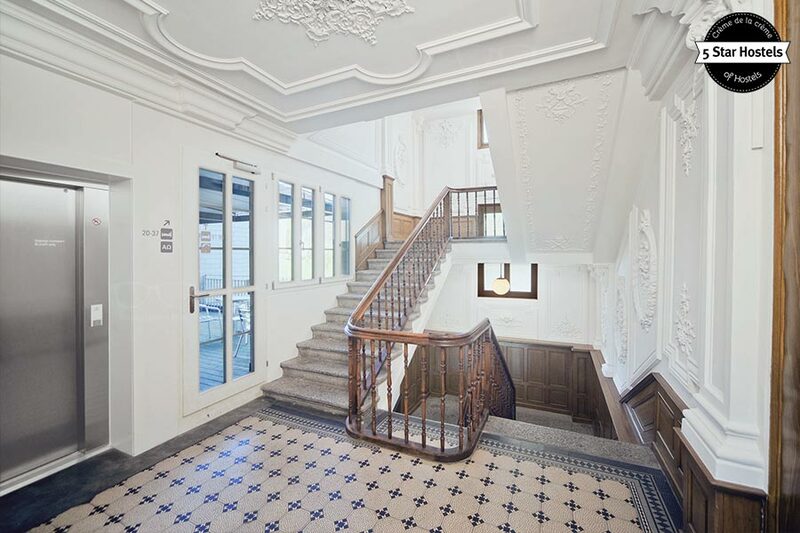 And remember when we said there are only a few exceptions of gorgeous top hostels in Switzerland? Well, here you go one more time. As the name suggests, Wellness Hostel 4000 offers amenities that focus on your health and well-being. When you’re not outside, make use of the large indoor pool, fitness centre and trendy restaurant come bistro. The rooms are basic, comfortable and offer wonderful views from the large windows. Here is a video of the Wellness Hostel 4000. The video is in German, but there is English subtitle. The video shows the impressive spa area, sauna, the bed rooms, and actually everything. Well you guessed it; Grindelwald is yet another village in the alps which is perfect for skiing and hiking! Switzerland just keeps on giving. What makes this destination stand out from the crowd? It’s the base for mountain-climbing up the iconic North face of the Eiger. Who’s felling brave? Downtown Lodge is unique, simple and central and the largest lodge in Switzerland. Alongside a beautiful location and cosy stay, staff will gladly help you plan your Swiss adventures. Don’t be shy to ask! This is the capital of the district and a walled city that’s home to an ancient monastic settlement. Sounds cool, right? It’s a great destination for anyone that enjoys exploring an Old Town of a city, views of the Alps and fun open-air events. 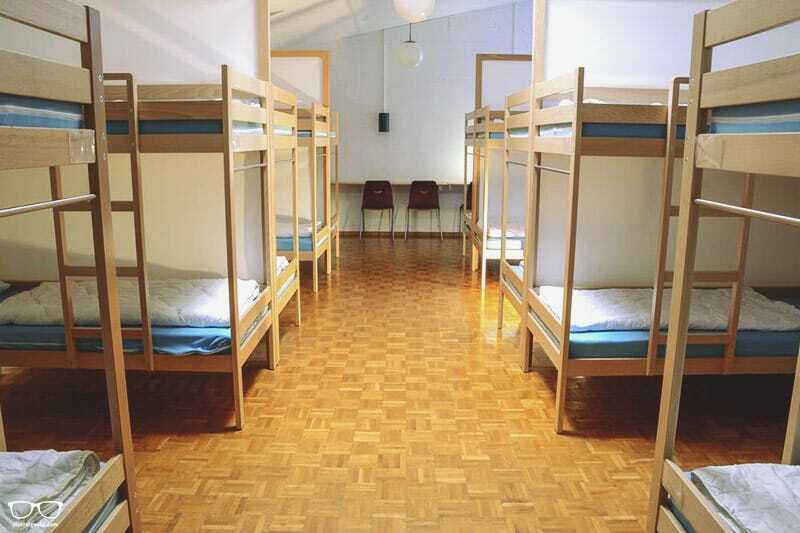 Our only hostel in Zofingen is a basic youth hostel that is great for families, groups and friends. We say this because there is heaps of space and it has a central location. From the outside it looks like a big, fancy house! All of the shared and private rooms come with linen and Wi-Fi. This part of Switzerland is Italian-speaking and is quite similar to Italy’s Lombardy region. The cool mix of Swiss and Italian is reflected in the delicious food and architecture. Oh and to top it off; there’s a stunning glacial lake and mountain peaks surrounding Lugano. Yes please! This small hostel has been decribed as more like a B&B than a hostel. That’s becase it’s cosy and the staff are welcoming and friendly. Youth Hostel Lugano is just outside Lugano’s centre, and easily accessible. There’s a pool, garden, pool table and super cosy rooms. The pictures kind of speak for themselves, don’t they?! You’re about to discover a really useful map below of all the top hostels in Switzerland already mentioned in this article. From Geneva to Lausanne, from lake to mountain. We hope this map will help you better plan your upcoming backpacking Switzerland adventure! You can also share this map with all your backpacker buddies. Many travellers in Europe hop between a few countries during their trip – it’s a great and surprisingly easy thing to do! So let’s imagine you’ve already explored Switzerland and you’re eager to keep going. How does Switzerland compare to other European countries?! Other popular destinations include Lyon, Milan and Munich. Find all our hostel guides here. Remember to dress for the weather, especially if you’re visiting Switzerland in the winter time! You can find all our valid discount for hostels here. And remember, above you can find already discounts and promo codes for some of the coolest Swiss hostels. By now you should have the answer to your question where to stay in Switzerland. It is an amazing country. Yes, it is expensive, but worth it every penny. Hostels will help you to stay within your budget. 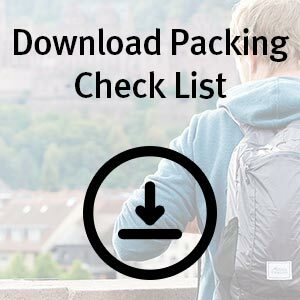 This guide is your shortcut to your hostel-picks, saving you lots of time in your accommodation research. Update: We now cover as well curated 3-best hostels guide to cities with no 5 Star Hostels such as Paris, Seoul and Sydney. Then please please leave a comment below. We would be thrilled to hear from you and to help a fellow backpacker.